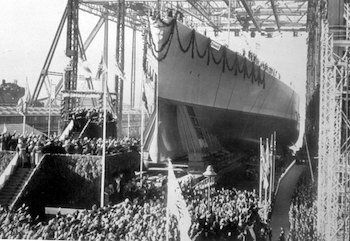 Germany launches the battleship Bismarck. Britain announces that all merchant ships will be armed. Hitler starts to apply pressure on Yugoslavia to join the Tripartite pact. Kurmuk near the Ethiopian border in Sudan is recaptured by British forces. Leading elements of the German 5th Light Division arrive at Tripoli and are immediately moved up to Sirte to take up defensive positions. Western Africa front: South African forces conquer Kismayu in the Italian Somalia. Bomber Command is issued with Directive No.22, which ends the recent period of aircraft conservation by the RAF, although attacks are still not to be pressed in the face of bad weather or ‘extreme hazard’. The reason for this change is that the new Lancaster bomber, was just entering service and that Bomber Command was now equipped with a new navigation device called GEE, which it was hoped would make locating targets easier. However, it only had a range of 400 miles and could be jammed. The Russians introduce universal labour conscription. The Japanese being their invasion of Sumatra with airborne landings at Palembang. The Battle of Pasir Panjang ends in Japanese victory. The Battle of Bilin River begins in Burma. The British Air Ministry issues the Area bombing directive, ordering RAF bombers to attack the German industrial workforce and the morale of the German populace through bombing German cities and their civilian inhabitants. British auxiliary patrol vessel Li Wo singlehandedly attacks a Japanese convoy north of the Bangka Strait, sinking the lead transport before being sunk by the squadron of escorting warships. The British gunboat HMS Grasshopper is bombed and sunk by Japanese aircraft off Rusuk Island. The American converted troopship SS President Taylor is grounded on the coral reef at Canton Island and can not be salvaged despite extensive efforts. Sarawakian steamship Vyner Brooke iss bombed and sunk by Japanese aircraft while evacuating nurses and wounded servicemen out of Singapore. The German submarines U-178 and U-336 are commissioned. The 5th Panzerarmee under von Arnim, forces the retreat of the US 2nd Corps, inflicting very heavy losses in the battle of the Kasserine Pass. Dakotas of No. 31 Sqn and Hudsons of No. 194 Sqn begin air supply missions to Chindit forces working behind enemy lines in Burma. Chindits were small pockets of highly trained British troops, usually with local guides, who operated behind enemy lines, cutting enemy lines of communication. The name was taken from that of a mythical Burmese God. The VMF-124 Corsairs joing other fighters escorting Liberators on a raid to Kahili, Bougainville. They meet 50 enemy aircraft and only 3 Zeros are shot down while 10 US aircraft are lost; 4 P-38s, 2 P-40s, 2 Liberators and 2 of the Corsairs. This engagement becomes known as the “St. Valentine’s Day Massacre”, an inauspicious debut for the Corsair. Eisenhower sets up the SHAEF HQ in Britain. The Americans announce that the Japanese remaining in Solomon’s are now trapped. Uruguay declares war against Germany. Canadian and British troops reach the Rhine, 40 miles Northwest of Duisberg. The 1st Ukrainian Front encircles Breslau which has been declared a fortress under the command of Gauleiter Hanke. The siege of Budapest ends as the Soviets take the city. Only 785 German and Hungarian soldiers managed to escape. The British Indian 4th Corps begins to cross Irrawaddy and strike into the Japanese rear. The first use of napalm is made in Burma.